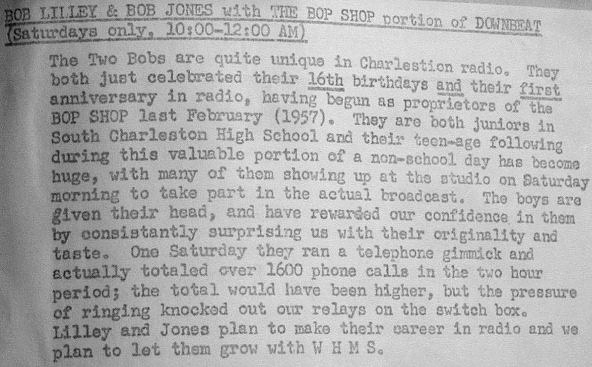 My parents thought I was running away to join the circus when I mentioned that my friend Bob Jones and I, then high-school students in 1957, had been hired to do a two-hour Saturday radio program on Charleston, WV station WGKV-AM. (Actually, I met more weird people later in college than I ever did in radio.) These were neat co-workers. 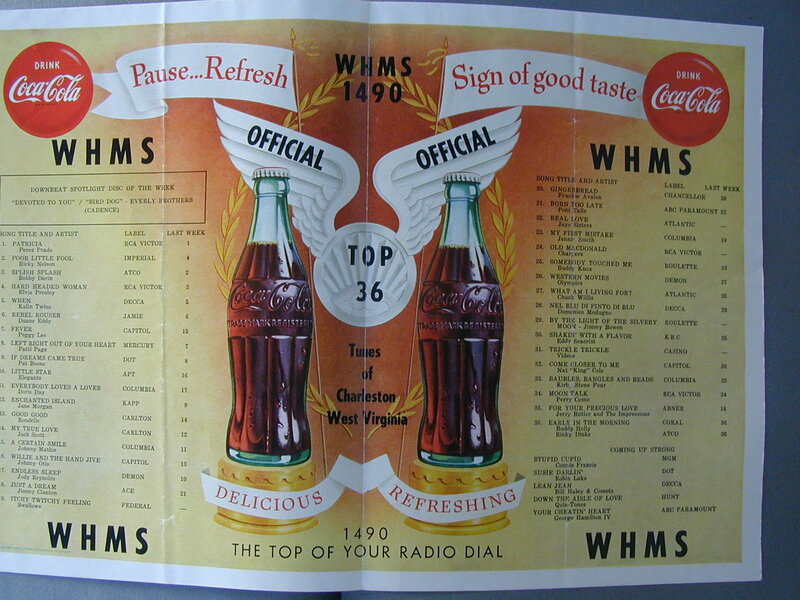 The station later became WHMS-AM, still a 250-watt voice. 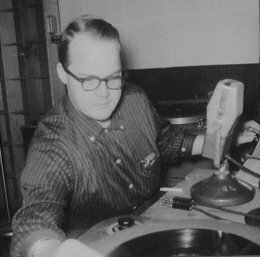 Four turntables and a whole rack of reel-to-reel tapes were the programming sources, plus some network feeds from ABC Radio. Look at that jacket! And it's red corduroy! I don't remember ever really dressing up to do studio work; the jacket was part of a dance-band uniform (the Chemettes, a South Charleston High group). I used to wear that coat when I played records for WHMS in a glass booth in the parking lot of the Parkette in Kanawha City. Even I don't believe it, but I still wear that jacket for Holiday events, almost 50 years later! See below. 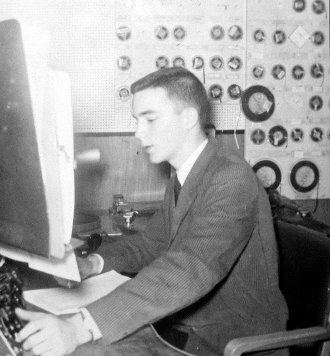 This was the WHMS control room, about 1958, with the "new" RCA board that was installed about the time Joe Brechner took over. Four turntables; two Rek-O-Kut 12" and two RCA 16" units. Two Magnecord reel-to-reel tape units out of sight to the right. 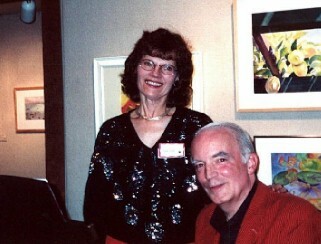 Here's that red coat again, in December, 2001 at the piano for a social event in Santa Barbara. That's also Ellen, putting up with me since 1964. The station gave us some publicity, and generally made us feel at home. Jones went into radio as a profession; I did not. Enlarge Some nice people took a chance on us and helped us grow. Bob Barron was Program Director when we started. 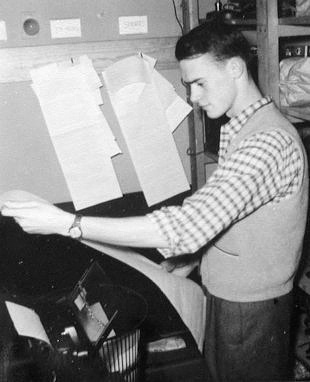 Left: Bill Miller (Kay Lowther, really) in the production studio - note the classic RCA 44DX mike; Bill became Program Director after Bob Barron left for a position at WTIP(WKNA?). 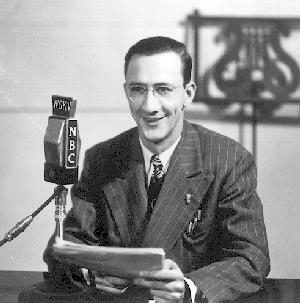 Before a format change, he hosted the "Hour of Sounds," a Saturday jazz show. He became a minister after the radio days (see his message, below). Plays great piano, too. I feared we had lost touch, but see below for an e-mail exchange in late 2006. Center and Right: A very boyish Ed Rabel, a few years before all those CBS TV exploits! From a December, 2006 e-mail from Kay Lowther: A very nice update on many of the WGKV/WHMS people. 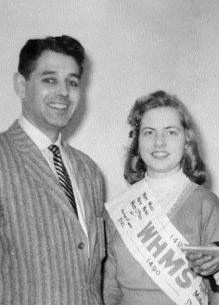 First, the girl named Jeanie who is shown with Carl Margin is Jean (Jeanie) Jesperson, who was our continuity director. She had a great, if slightly bizarre, sense of humor, much like the rest of us in those days. 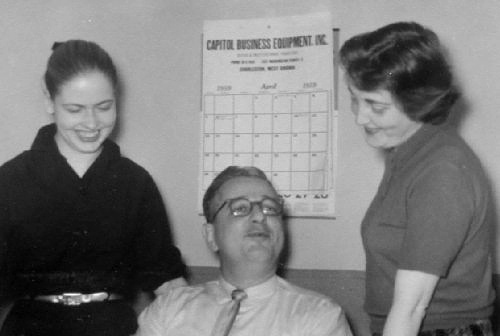 One person you don't have a picture of is Pearl Richardson, who was the secretary before Myra came to work. Otherwise, I think the roster is pretty much complete. Incidentally, Myra is retired following the death of her second husband, and living in Ormond Beach, Florida. The Rondells, of course, was the band I was affiliated with, (see attached picture) along with Ned Guthrie, Jr., our leader. I have just done a whole bunch of stuff on the Rondells in answer to a request of a friend of mine; if you would be interested I would be glad to share it. And of course you have already noted Jennie Smith (Joann Kristof). The one you may not remember is #30, Shakin' With A Flavor. This was performed by Eddy Seacrist and the Rollin' Rockets [Click Here]. Eddy (real name Melvin) was from up Cabin Creek somewhere. 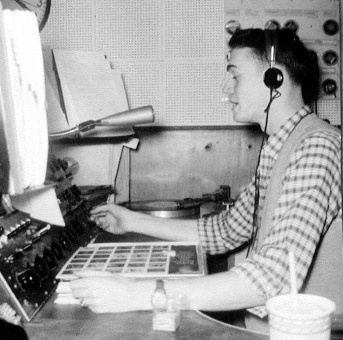 He began broadcasting as a straight country band on WMON Montgomery in the early 50s. He also played almost every night somewhere in a local dance hall in the upper Kanawha Valley. His guitar player was Norman Chapman, formerly a Nashville studio musician who moved back to Smithers, WV at the behest of his wife Glendean, and who wound up playing with Buddy Starcher on WCHS-TV every morning at 8 a.m for several years in the early 60's. The Rollin' Rockets did a live show on WOAY-TV Oak Hill every day and worked the local area beginning in the mid-50s.. 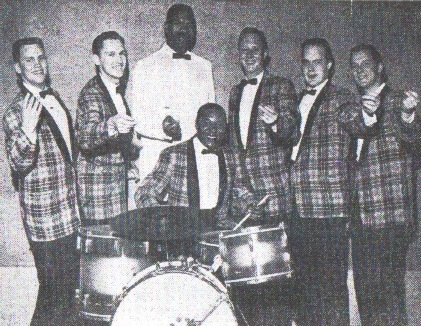 Sometime around 1958 or 1959 they became the house band at the Twin Maples nightclub in St. Albans, a place "where good friends met to kill each other." I know, because in the twilight of the Rondells' career we took over their spot at the Maples when they went back out on the road. They were a juke joint band of the first order. They would remind you a lot of Bill Haley and the Comets in their style (few people today remember that Bill Haley got his start as a country band leader...he always carried a steel guitar player with him, even after the transition to rock 'n roll). "Shakin' With A Flavor" did quite well locally, although there was never any national action on it. He later recorded another single for the same label called "Silly To Dream" b/w "Able One." (Able One was rocket slang; it was a guitar sendup featuring Norman Chapman). 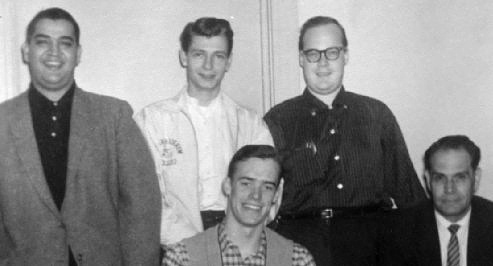 Eddy had a band into the mid-sixties, at which time he apparently followed the same path which I have walked, got right with God, and became a Pentecostal preacher. Incidentally, you were right in your notation that I became a minister. I began teaching the Bible in 1966, served as a lay minister for many years, and was finally ordained in 1997. I always say that the reason I waited until I was 63 to be ordained is that I despise eating chicken, and any minister worth his salt has to eat a lot of it! I am attaching a copy of the bio that I send around whenever someone asks for a copy, also a picture of me and my second wife Sherry, who works with me in the ministry when not laboring from the West Virginia Division of Health and Human Resources as a systems analyst. We were married on August 18, 1979 and are happier about it today than we were then (we were pretty happy that day as well!). I am still playing and singing, probably as much as I ever did. Our ministry, Ekklesia Ministries, has our own record label, and at present we have seven CDs in the repertoire. It is amazing what I can do sitting in the living room of my home, compared with what recording facilities were like in our radio days. Oh yes, Al Sahley is semi-retired after a long, long stint at WCHS radio and subsequent entry into several family businesses. I see him every now and then; he is the same old Al. Nobody ever came close to his outrageous humor on a morning show in Charleston. He and his brother are doing a little real estate and also building houses for sale down in Teays Valley, which is a booming real estate market especially ever since the Toyota transmission plant was built in Buffalo, across the river. Kay and Sherry Lowther, 2006 The Rondells, 1950s - Kay Lowther second from right. Now, when you enlarge this (400K!) note that singer Jennie Smith is in number 23 spot. She is a Charleston-born lady (daughter of a radio personality). I was privileged to interview her on the air. Enlarge We played a top-40 format, with a quieter Sunday, except when I insisted on playing jazz on "Sunday Serenade." 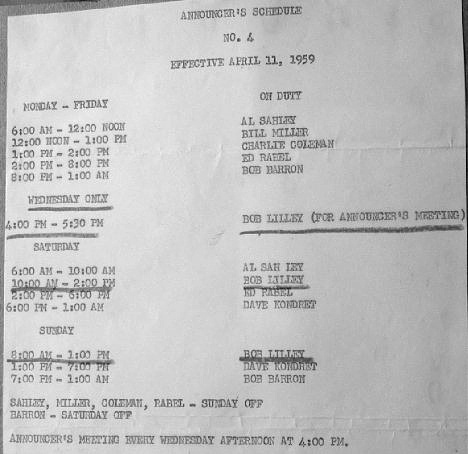 It was "personality radio," but with relatively little talk, much music and news on every :55 (we were an ABC affiliate). Here's Jennie Smith with the family. Note the "Capital Airlines" propeller craft in the background, at Charleston Airport. I have a couple of her records. 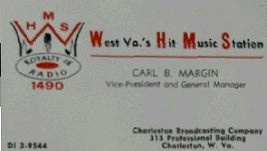 In the earlier 50s Phil Vogel worked at WGKV, the forerunner of WHMS. 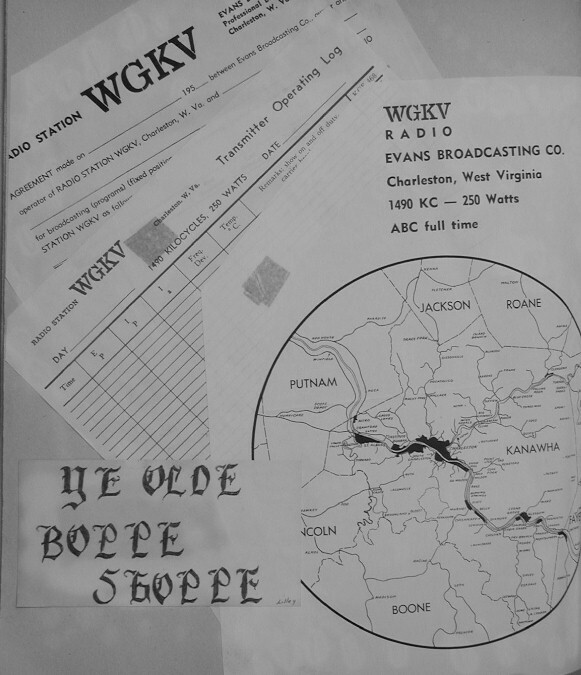 This was back when I used to visit WGKV on Dickinson Street to watch the operations and talk with Bob Entley, an announcer there at the time. Air staff from the left: Al Sahley, Dave Kondret, Ed Rabel, Bill Miller, Charlie Coleman. From left: Harv Morgan, Program Director; Norman Posen, GM; my next-door neighbor at the time, the late Tom Connolly, a fellow named Loudermilk (from WKLC? 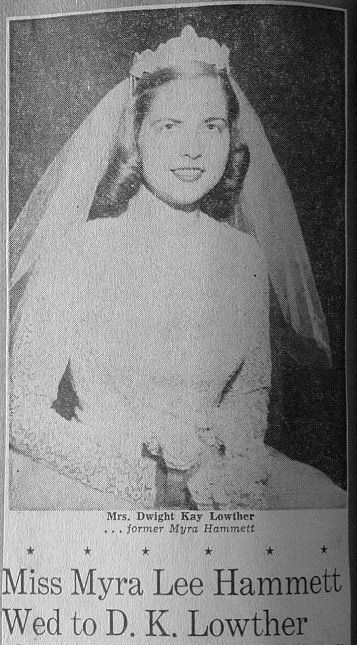 ), and Myra Hammett, who later became Mrs. Kay Lowther. This was labeled "Call Letter Contest" Maybe Tom Connolly came up with WHMS...I can't remember exactly. Just got word that Harv Morgan died November 16, 2000. His son Brian sent a copy of a press release on Harv's death, and there is considerable information on the WWW just by searching on "Harv Morgan." A good person. I enjoyed working with him. with Myra Hammett and Jeannie Jesperson, continuity director. Myra replaced Pearl Richardson as secretary at the station. Some scrapbook items; Norm Posen's arrival, Myra's wedding to Bill Miller, and Myra/Norm promoting the station. I used to visit with Hugh McPherson over at WCHS on Virginia Street in the late night. 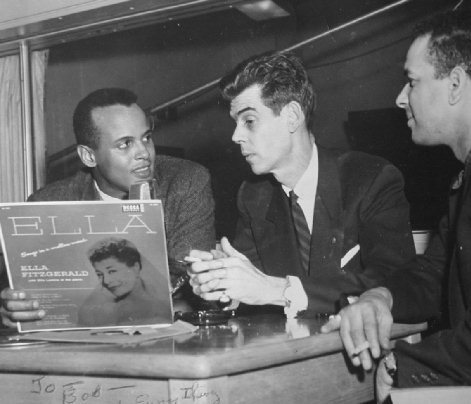 Here he is with Harry Belafonte and his guitarist Millard Thomas. I got to know Joe also, Hugh's mynah-bird mascot. Later, my wife and I were inspired to keep a pet mynah -- turned out it was all too easy to train him to talk...another story! 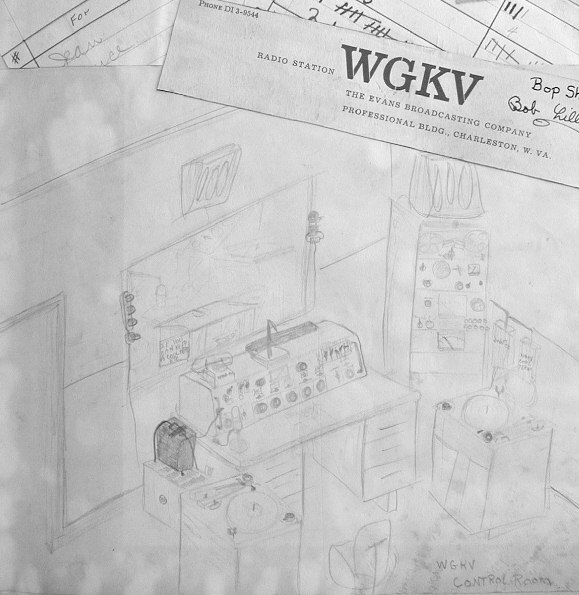 When I first started at WGKV, I sketched (badly, I'm afraid) the control room. This was an old RCA board, with two vintage turntables. The black box in the foreground is the telephone "beeper" that we had to use in those days to let people know they were being taped or broadcast (when was the last time you heard of that courtesy?). We ran the transmitter by remote control, selecting the parameter to adjust or monitor using a telephone dial unit in the relay rack at the right. The rest of the rack was a compression amp, a frequency monitor and a Conelrad unit.